The Vorenberg Family pioneered in northern New Mexico in the 1880’s with the arrival of Tresa’s grandparents, Simon Vorenberg and Theresa Harris Vorenberg, who came west from Pennsylvania. Simon named the town of Cleveland, NM where he opened a US Post Office in 1892 and was the first postmaster. He later ranched and owned the Vorenberg Mercantile Company in Wagon Mound, New Mexico. Tresa's father was the youngest of seven children born in 1907 to Simon and Theresa in their Wagon Mound home, prior to New Mexico's statehood in 1912. The home still stands today, and the building that housed Vorenberg Mercantile Company has become a local church. Simon was a delegate from Mora County to the Constitutional Convention that was convened in Santa Fe in 1910 as the Territory of New Mexico was becoming a US State. The Vorenberg Family is included in the Jewish Pioneers of New Mexico Exhibition at the Palace of the Governors in Santa Fe. jewelry designers also began at that time. Tresa specializes in fine quality custom work suited for the individual. She is a master of many techniques and works with a wide variety of gemstones, diamonds, and fancy colored diamonds set in karat golds. Her fresh contemporary style sets her jewelry apart. Her concern with the function and comfort of each piece is the cornerstone of her success. “What I love about jewelry making is the avenue it gives me to celebrate life and joy. I often have the privilege of looking into windows of people’s lives and getting to make something of significance to help them commemorate an event. It could be wedding rings, an anniversary or birthday gift, saying ‘Thank you, you’re special!’ or celebrating one’s self worth. 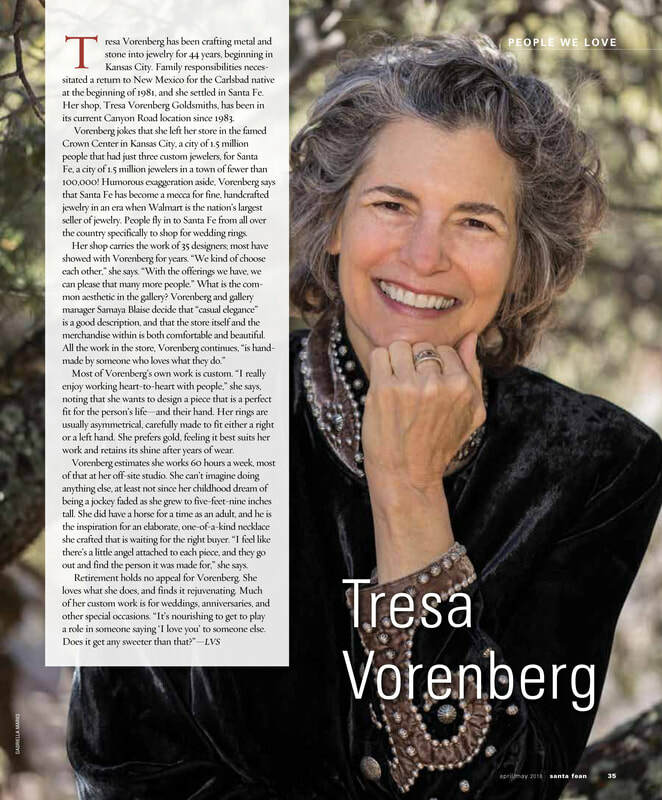 It’s my own way of devoting my life to ‘The Good,’ and in some small measure, helping to bring it about.” Tresa muses.